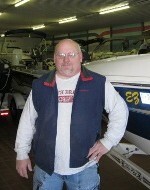 Brian Nelson has worked for Hallberg Marine for 24 years. He is a man of all trades. He was a mechanic, worked as a salesperson at the used boat building, and was our service manager for five years. He is now selling at our new sales department. His choice of music is gospel and contemporary.